This easy-to-grow mixture of annual varieties of the native Sunflower species (Helianthus annuus) will flower from mid-summer into the fall. The large flower heads (some up to 14″) and the tall stalks (2′ – 10′) provide striking colors for a screen or to enhance a garden strip along a wall or fence. 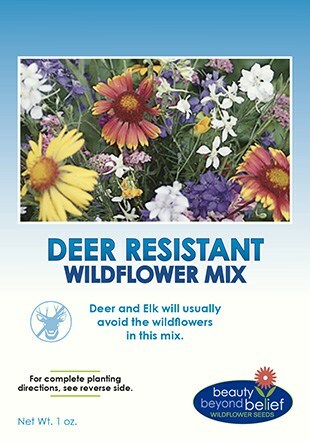 This blend of colors and flower styles can be used for cut flowers, to harvest seed and to attract birds. This easy-to-grow mixture of annual varieties of the native Sunflower species (Helianthus annuus) will flower from mid-summer into the fall. The large flower heads (some up to 14″) and the tall stalks (2′ – 10′) provide striking colors for a screen or to enhance a garden strip along a wall or fence. 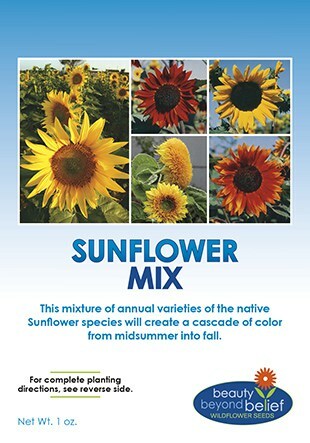 Sunflower Mix has a blend of colors and flower styles that can be used for cut flowers, to harvest seed and to attract birds. We recommend to seed this mix in rows spaced about 2 -3 feet apart and allow room for trellis or support for the very tall sunflower species. The shorter species will fill in the lower areas.